Discussion in 'Fallout General Modding' started by Mash, May 14, 2008. Well, yes, I even created a second FO2 directory, because I thought he couldn't handle 'Fallout 2', so I made 'Fallout2'. Ok, it wasn't the paths, I had to change the language from English to German. So I installed the cd release of Fallout 1, US 1.0. Then I installed the US 1.1 patch. Lastly, installed the High res patch ver 4.1.8 and the game gives me a loading screen and kicks me back to desktop. Tried everything from resolution changes, compatibility, admin, sfall, color bit. NOTHING works, without fail. Did I do something wrong? Is the retail release incompatible? Should be compatible... Try enabling debug log in ddraw.ini (at the end of the file) and see what is says there. Is there any way to fit worldmap? It looks like small box centred on black screen. Maybe that issue was already adressed but this thread has quite a lot of pages. 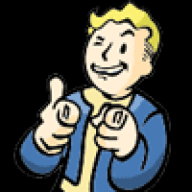 I am currently making a thread about the solo adventure made by fans with the Fo1-Fo2 gameplay. Amongst those things that need to be adressed is the hi-res compatibility. For the newer mods or those who are still updated by their creators, the compatibility with hi-res is not an issue. For the older mods who didn't account for it and are no longer updated, it sometime works, sometime need a work around. Otherwise, playing without it means some graphical glitches and overall a low-res that our eyes are simply no longer used to. On the other hand, if i simply stick the high-res with no other input, i might get some issues with black screens on the sides or being unable to scroll the camera in some locations. The work around that i keep using right now is twinkering with some of the setting that aren't in the menu. I open the *f2-res-Config* file and then choose *Manually Edit Config*, which open a notepad file, then i look for the following lines. This usually allows me to see everything on the map (including the part that we left out by the modder), scrolll into any directions i want, and move my character anywhere i can (within the limits allowed by the modder), while avoiding the most awfull graphical glitches and play with the resolution i want. It simply makes the mods playable and enjoyable with modern hardware. Althought, there are still a couple of side effect that i couldn't get rid of yet. First, when i enter a new map or when i leave the dialog box, the screen tend to center when it wants (i guess the center of the map) instead of centering around my character. It can be troublesome when you enter a map for the first time. Afterward, you usually know when your character is, and how far from the center, so you scrollback accordingly. But when you don't know, you have to move the camera a lot. Second issue i have is with the mouse cursor. You usually have two mouse cursors and you change between those by right clicking. There is the more classical mouse cursor that you use to interact with people and objects or to activate some skilles, and the red mouse cursor that you use for moving your character. When expand my scrolling abilities to use the high-res mod on older mods, and move by mouse on the right side of the map, i only get one kind of picture for the mouse cursor. It is a brown arrow. That only has an effect on how you see the mouse. If you move your mouse to the left side of the map, you can still switch the two cursor modes, and go back into the right side of the map and do your actions (moving, talking, interacting, using skills, etc...). The issue is not with how the mouse cursor works, but how you see it. So, i am wondering. Do i use the high-res setting wrong ? Is there a work-around that i should use ? Was this issue already adressed ? Is there a patch released or on the way for those oldies ?